Purchase the Better Homes & Gardens Rolled Arm Accent Chair for decor. Only $155.00, regularly priced $199.00 + Free Shipping AND Free Store Pickup on Walmart.com. 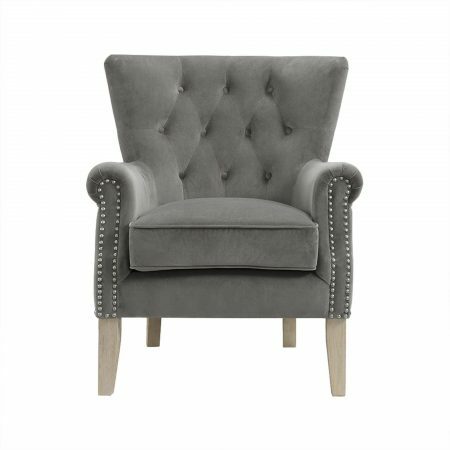 Add a touch of style and texture to any room in your home with the versatile Better Homes and Gardens Accent Chair. This beautiful chair lends itself to many different styles making it a wonderful choice for any living room, bedroom, or any other place you might think of! It is upholstered with a soft twill fabric that will create an inviting place to relax while the brass nailhead trim will give your decor a boost of edgy sophistication. The channel shaped back provides comfortable support while the button tufting highlights the chair’s elegant design. Lively up your home with the standout beauty of the Better Homes and Gardens Accent Chair.